Portland is by far one of the most underrated culinary cities in the United States. R & I had little expectations when we first arrived, but quickly we fell in love with it. Portlanders are very friendly, the food scene is top notch and the whole city vibe is unbeatable. I put together this guide to Portland with our recommendations of the best places in the city! 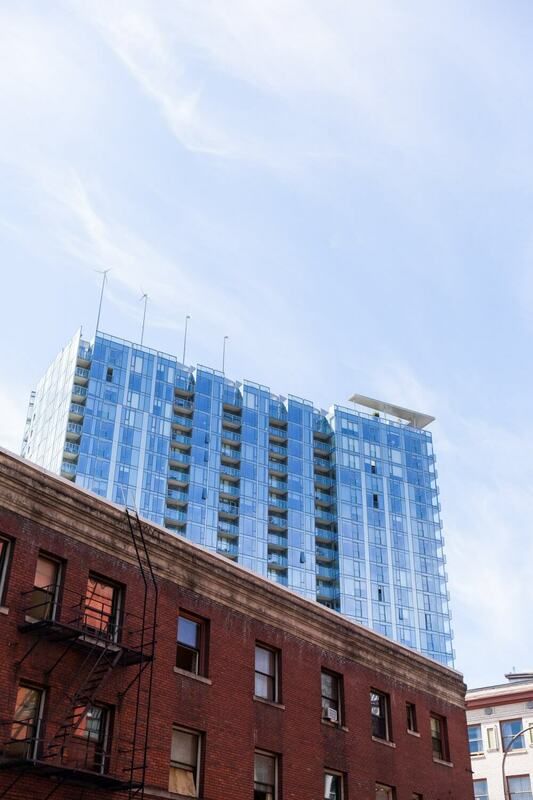 Anywhere in DT Portland is fine as the city is easy to navigate and very safe even at night. The Marc Spencer hotel though, was in a prime location. 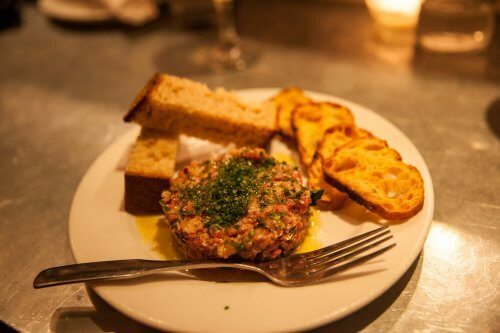 It’s a short walk from a number of restaurants and bars and has some of the best food on the same block. The room was nice, the bed comfortable and the staff friendly. I highly recommend it. Portland is a very laid back and “weird” city. You won’t see anyone with heels here, but you’ll see many REAL hipsters (just don’t call them that to their faces!). Dress comfortably! 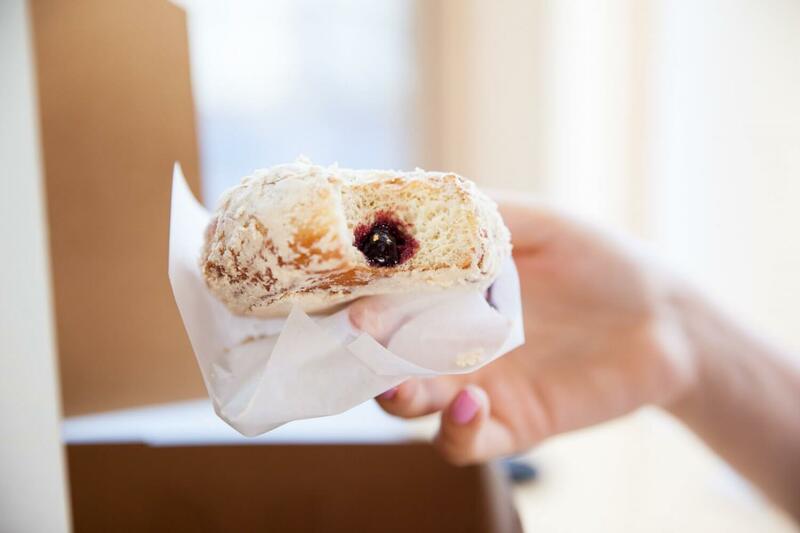 When you come to Portland expect to gain weight because everything is delicious! You gotta start your morning with coffee. Stumptown coffee is the best damn coffee you’ll ever taste (read here), with many locations spread out the city. Blackrock coffee has great speciality drinks and very chic decor. Blue Star donuts are a must! The Pina Colada and PB&J were my personal favorite. For lunch, stop by Pine St. market and slurp some Marukin Ramen or pass by the many street food carts for a delicious and quick bite! Salt & Straw Ice cream will always have long lines, but it’s the perfect afternoon treat. I’ve talked all about it here. As for dinner, there’s so many options to choose from. I think I’ve convinced you to try Bamboo sushi in this post here. Another great restaurant is the Mediterranean Exploration Co.. The food is created by culinary genius chef Kasey Mills. 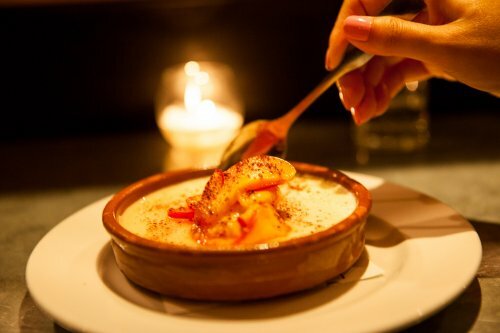 It’s the prefect place for a tapas style feast. Come in numbers because you will want to try everything on the menu. The raw “Kibbeh”, grilled peach, grilled octopus and halva semifreddo will take you right to flavor heaven! Try their amazing cocktails and wines! 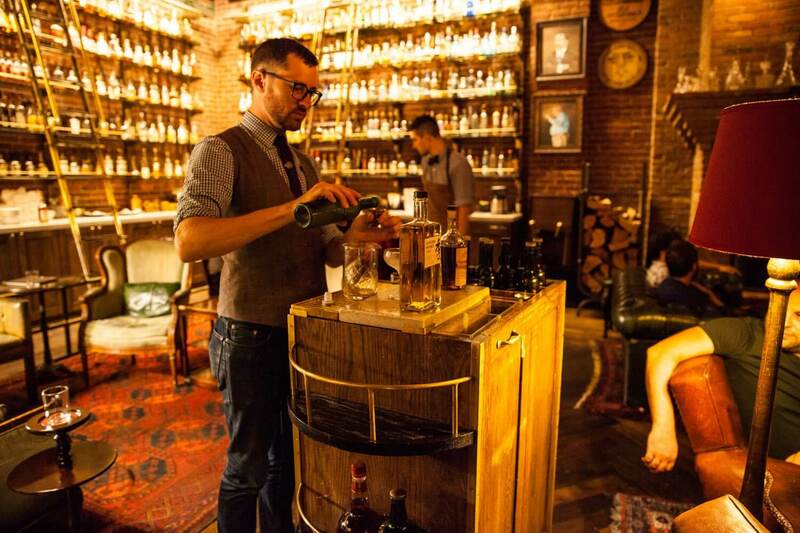 The Multnomah Whiskey Library is a must visit whether you’re whisky drinker or prefer cocktails. Come early since the wait list can fill up quickly. While you’re waiting, have a drink at the Green Room downstairs. The Whiskey Library is made to feel exclusive, almost like a treasure that only a select few are lucky enough to explore. The decor, all made of wood and leather, makes your experience memorable. The walls are completely covered with bottles, so the bartender will have to climb a ladder to get to the right one. So just sit back in your comfy leather sofa and wait for you private bartender to come with his cart and pour/mix the drinks for you… It’s a one of a kind experience. Powell’s bookstore is the largest independent bookstore in the world! You could easily lose an entire day here if you’re a book lover! Nob Hill is a good shopping destination with a lot of great restaurants. 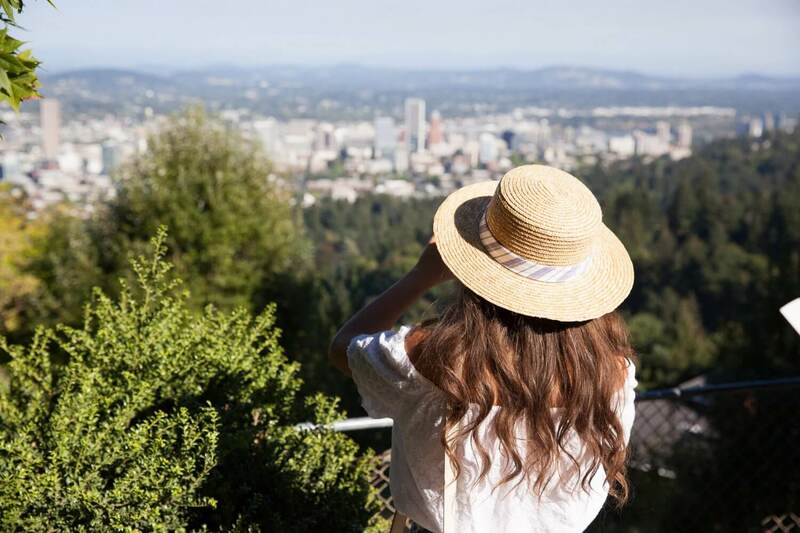 For the best views of the city head over to the Pittock Mansion. Overlooking the city, this historic mansion will take your breath away! This is my guide to Portland for now. R & I will probably be visiting this city again sometime soon and we will be adding more spots to this guide. Until then, we will keep dreaming of the unforgettable time we had in this lovely city! Isn’t it?! I just loved it! Portland looks so sunny! Why am I surprised by this?! It’s usually rainy there, but we got so lucky with the beautiful weather! I’ve always wanted to visit Portland OR! It looks like such a fun city. Great suggestions, if I even get the chance to visit I will for sure be taking your suggestions! It’s a fun and lovely city, if you get the chance you should def. visit it! It is indeed! I hope your weekend is going great! Essa cidade me lembra muito o livro “Cinquenta Tons de Cinza” que tem partes ai. Gostaria muito de poder conhecer! I think you’ll love it! It’s a fun and “delicious” city! A must see city for sure! I hope you’re having a great weekend Kate! I’ve heard amazing things about the Whiskey Library! We’re definitely making a stop there on our next trip to Portland. Thanks for sharing your experience! It’s amazing, you’ll love it for sure! How fun! I’ve heard so many good things about Portland! Gorgeous pics! Pina Colada donuts? I really need to visit Portland. Great impressions! Those donuts are soooo good! Worth the fly to portland just to have them! It’s such a lovely city! I have never been to Portland, but would love to visit! I love those patterned pants! Great! 🙂 I’ll be visiting Portland soon and I can’t wait to see a few of these places. Salt & straw is going to be a definite visit! Thanks for sharing. Ohh you gonna have a great time in Portland for sure! Beautiful! Portland is not too far from me! Such a unique city! Love love love those pants! Fabulous! It is indeed unique. Thanks for stopping by Ruth! Portland looks like an interesting city. I would really love to go to that bookstore. Powell’s bookstore is just amazing! You can find, used and new books! I was just there for the first time in July and that whiskey bar would have been great to try! It really does have such a friendly easy-going vibe! The whiskey bar was definitely one of the highlights of the trip. You should check it out on your next visit! Portland is a cool town! Love your outfit! Great photos and editorial, Tamara! Thank you so much Luci! Tamara, girlie, you are such a BEAUTY! Honestly. Loving that second shot of you! You’re so right, Portland is super underrated. In fact, if it were not for reading blogs, I would’ve never had known how awesome the food is there. Though I’ve personally never been, every single blog I read raves about the food scene. I’ll have to reference your posts whenever I plan on visiting, which I hope is soon because I LOVE some good food, haha! Thanks so much for sharing, gorgeous, and I hope you have a great weekend ahead! You’re the sweetest Jalisa! The food scene is indeed amazing there, as a foodie you shouldn’t miss it! I’ll be travelling to the US again next year and now Portland is on my radar thanks to this blog post! I must get my hands on one of those Blue Star donuts! I went to Portland for the first time ever this past July 4th and loved it. Wish I had your blog to read before then so I could have explored more, ugh now you make me want to go again! I honestly never heard of Portland. Which isn’t strange maybe, since I’m not from the States myself. But it looks oh-so lovely to visit! Gonna tell my boyfriend this weekend about it. When we’re moving to the States, we need to visit as much nice places here as possible. This might be a city to think about visiting as well! So, so lovely! And that outfit is perfect for traveling and sightseeing! Wow, that whisky library looks amazing! I’m not a whisky drinker, but my fiance would absolutely adore going there! I think I would pay Portland a visit on my next trip to the states. Great post. Wow, your blue-white pants are so amazing! I haven’t been to Portland in years, but I had to laugh at your descriptions!! As for the food…that’s the whole reason we go travelling—gotta try new and different things!! What a fantastic guide, I’m officially hungry! Great post! I have always wanted to visit Portland and now I want to go even more! Fantastic guide, I hope I can go one day!! Your pictures are so stunning! I found your blog a couple of days ago and I’m obsessed! Cool pictures! Love your blouse! Looks like a really nice place to go.